DUBUQUE, Iowa—Sen. Sherrod Brown (Ohio) wants to show Democrats how to win back working-class voters. While other 2020 contenders are dashing to embrace identity politics and "out-progressive" one another, Brown is hitting the same notes that have made him a staple of Ohio politics. His message, a mix of populism and New Deal traditionalism, places equal importance on fighting for "women's rights, voting rights, and civil rights" as it does on "workers' rights." Traveling throughout Iowa last week on the first leg of his Dignity of Work listening tour, Brown got to pitch this brand of Midwest populism directly to voters. 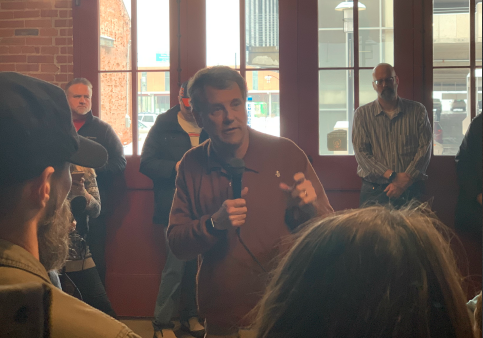 "I grew up in a town just slightly smaller than this," Brown told a gathering at Dubuque's Inspire Cafe, a fair trade coffee shop, on Saturday. "It's gone through a lot of the same issues … where people have worked hard all their lives and now they don't have the same pensions they used to have. They don't have the same wages they used to have, the same opportunities for their kids." Dressed casually in khakis and pullover sweater, the senator told those in attendance that the "bottom dropped out" for Democrats in the Midwest because they no longer understand how to respond to those challenges. Brown, who claimed that he never had a "lifetime dream to run for president" and was "not sure" if he ultimately would, also attributed the party's failures to the mistake of having prioritized "talking to progressives" over "talking to workers." "Democrats don't talk to workers enough," he said to large applause. "Democrats don't advocate for them on trade policy, we don't advocate for workers enough on tax policy." "Republicans pretty much ignore these communities, but Democrats don't come to these communities enough. We see this sort of division with big metro areas and small towns and rural areas. We've got to close that gap, we've got to close it politically because we know Wall Street doesn't invest, they just bypass [them] … and the government just ignores these communities." The gap, according to Brown, explains the reason why Donald Trump won in 2016 and may be headed towards re-election in 2020. Trump's path to the White House, despite a three-million popular vote deficit, ran through states and counties in the industrial Midwest that previously were Democratic. Some of those counties, like the one where Dubuque is located, hadn't voted for a Republican at the presidential level since the 1950s prior to casting their ballots for Trump in 2016. Although Brown didn't say it outright, working-class voters, specifically non-college educated whites, made the difference. In 2016, non-college educated whites overwhelmingly backed Trump over former secretary of state Hillary Clinton by the largest margin since 1980 (67 percent to 28 percent). Although their numbers are decreasing nationally, non-college educated whites are still a sizable population in Pennsylvania, Iowa, Wisconsin, Michigan, and Ohio—states that put Trump over the top in the electoral college. For the party to "fight back" and have any hopes of ousting Trump from the White House, Brown argued it needed to be competitive and capable of winning back those voters. "If we don't talk to workers better as a party we lose our part of the country from Pennsylvania to Iowa," Brown said. "If we don't talk to workers … we don't win these communities, we don't win these states, and if we don't win this part of the country we lose the electoral college." "We simply can't allow a big popular vote margin, what will be 3-5 million in 2020, and then lose the electoral college," the senator continued. Brown's message and his brand of Midwest populism seemed to find a receptive audience in Iowa. Craig Reebers, who came out to the Inspire Cafe, told the Washington Free Beacon he found Brown's message "compelling." "I'm glad I came to listen. I like his message," he said. "We, meaning the Democrats, have to win all of these states [that] we lost last time. We're going to win New York and California, but we might not win Iowa or Michigan. I'm not sure if Kamala Harris can win those states, but I think he can." Reebers admitted that while "it was early," and he was still undecided, he believed Brown would make a better messenger for the party in the general election. "The Republicans are going to throw the ‘class warfare' argument at anyone who runs. I wish he could have got into that more today, but I think he's got a good way of dispelling that. He comes across as an average guy, not some elitist." Dave Roberts, a friend of Reebers who also attended the event, said he would keep Brown on his radar moving forward. "I want to see more of Elizabeth Warren and Joe Biden, but I like him," Roberts, who supported Clinton in 2016, said. "I think his message can appeal to all workers, regardless of race. Look at the people in this room, it's mostly older white voters, but what he says can apply to anyone, anywhere." Similarly, Nancy Timmons praised Brown's message and said she would consider voting for him in the future. Timmons, however, had some concerns about the venue Brown chose at which to meet the "real voters" of Iowa. "Did he really have to pick a place downtown where coffee is $6? There wasn't anything in there I wanted to eat or drink … and a lot of what they had I could have gotten at Hy-Vee for a lot cheaper," Timmons told the Free Beacon while exiting the event. "It just seems kind of weird, his message was great, why host it here?" "Downtown Dubuque is changing so much that not many working-class people can live down here. It's all lofts and expensive shops," she added. "I barely come down here anymore." This entry was posted in Politics and tagged 2020 Election, Democratic Party, Donald Trump, Sherrod Brown. Bookmark the permalink.